It’s going to be another cold weekend so I’m staying indoors to do some early Spring cleaning…yes, I’m even doing the boring chores. I don’t know about you, but I am super anxious for the warmer weather to get here so I can shed the layers and put away the snow shovel. Even though we have several more months before we get to that point, I wanted to at least get a jump start on it now. I refuse to let the wintery winds of January stop me from thinking about or even shopping for the Spring season because now is the best time to do so. I recently signed up as an affiliate for Hannah Jane, a new online boutique with some great clothing and accessories at affordable prices. I found a few cute pieces on sale/clearance that I will be adding to my Spring wardrobe, take a look and let me know what you think. I recently saw a fellow blogger in a classic white T-shirt, so I want to incorporate them into my wardrobe. 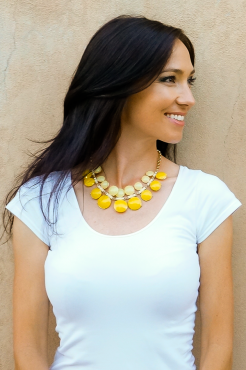 This Yellow Bubble necklace would be a perfect accessory to jazz it up. Fuchsia is such a fun Spring color and in jeans it will be great for a casual Friday outfit. You know that I love all things Polka Dot and this top paired with a Houndstooth infinity scarf would be great to wear on an early chilly Spring morning or evening. Or would it look better with the red scarf? 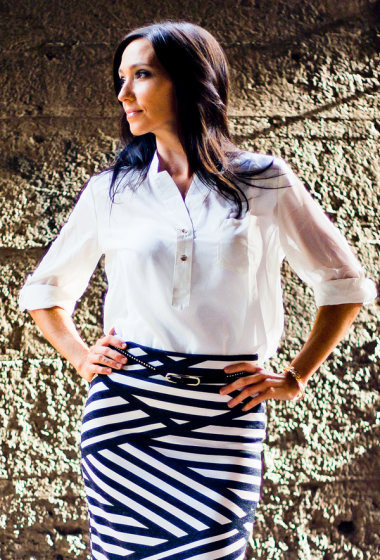 You definitely can’t go wrong with a White or Ivory button down blouse and I wish they had this skirt in stock! I immediately feel in love with this striped comfy, casual knit dress. 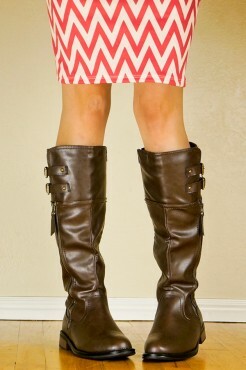 I could wear it with boots as shown or with pumps to work or even with ballet flats to run errands on the weekend. What do you think? We do have a few months of cold weather ahead, so I’ll wear a turtleneck underneath this sweater. AND… I finally found a pair of riding boots in my price range! The great thing about shopping at Hannah Jane, other than the prices is that they offer FREE SHIPPING on all orders over $50, and a flat $4.99 rate for orders under $50. Love the site and the prices are awesome! Def need to save up some of my pennies and do some serious shopping! They do have some great prices – make sure to sign up for the Newsletter so you can stretch those pennies even further! I love the idea but I have to say that this winter there just isn’t enough layering for me – although indoors I will happily rock the white t-shirt! I like the sweater dress…but can’t wear them. 🙁 I’m still wearing turtlenecks and sweaters daily…and will through March or longer! I like wearing sweater dresses with leggings, not alone. I picked up a few turtlenecks at Goodwill last week in some great colors so I am looking forward to wearing them up until March as well. That bias striped skirt is fantastic Antionette. And, of course, I’m gaga for the polka dot shirt with infinity scarf. Some great finds here…I know spring is a ways off, but a girl can dream. I know and it seems like Spring will be late coming this year! I did a search around the boutique..really cute stuff! That polka dot blouse is calling me…..
Love it with the houndstooth scarf. I know and you would look great in them! Ohhh! I’m digging those boots! Aren’t they nice…I can’t wait to get my order. I hope you had a great Monday.